What nails Are good for you? Artificial nail enhancement, they are not a replacement but a extension of the natural nail. Artificial nails help conceal or fix broken, damaged, short, or bad nails. It also helps prevent people from biting their nails, breakage of nails, and protect splits. They are used when people are not able to grow the length and strength of natural nails that they desire. Acrylic is a mixture of a polymer powder and a liquid monomer. The mixture starts to harden in 30-40 seconds after application and continues to cure to final hardness. Acrylic powders are available in a variety of colours and can used for special effects such as fades, inlays, sparkles and the always popular pink and white french manicure. There are some risks that come with getting Acrylic nails, it is very important to find a nail tech that uses top quality products that do not contain MMA's (see the dangers of MMA's page) the poduct line I use is Hand & Nail Hamony's Prohesion and Reflections products, these products are of the highest quality. 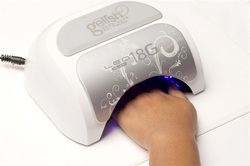 Gel Nails are created using a hard gel product that is cured under a LED or UV lamp to create an nail extension. Soft gels can also be used as an overlay to protect and help grow natural nails. Both acrylic and gel nails can be damaging if removed in a harmful manner, they should never be ripped from the nail during removale. Gelish is a paint on soft gel. It is not a artificial nail enhancement as it is applied directly to the natural nail and the nail is not extended. It is applied to the nail and cured under a UV or LED lamp. This is a new and unique alternative to the basic manicure. This polish can last up to 3 weeks, compared to a regular manicure which only lasts a couple days. Gelish is great for the client that wants a worry free manicure, this product is instantly dry and will no not smudge or chip. I always recommend this service to people who are going on vacation or have a special occasions. Gelish can also be applied over Acrylic or Gel nails. For a stronger manicure, a layer of structure can be applied, this is a good idea for people that are hard on their nails. Gel polish can be damaging if peeled off of the nail, it must be soaked off. If your salon is using pure acetone instead of the proper remover your nails may become dry and brittle after continuous exposure. There are no harmful effects to getting a manicure as long as the salon or spa practices sanitation and proper procedures. The more you receive manicures the stronger your natural nails will be and the better and younger your hands will look.